Il a gagné la course, ce qui est impressionnant. He won the race, which is amazing. Ce qui fait peur ici, ce sont les médias. What is really scary here, is the media. Je ne sais pas ce qui m'arrive. The pattern to spot is that we use ce qui when the next word is a verb or an object or reflexive pronoun (for example: me, te, se, lui, le, la, nous, vous, leur, les). Note that ce qui never becomes ce qu' in front of a vowel or a mute h.
Tu ne devineras jamais ce que Paul a fait! You will never guess what Paul did! When to use ce qui or ce que versus qui or que ? In cases where ce qui / ce que would also be translated by which in English, you need to ask yourself: What is que/qui/ce que/ce qui referring to? If it refers to a noun (expressed before), then you will use que/qui. If it refers to the whole part of the sentence, the whole idea, then it will be ce que/ce qui. Ces fleurs, qui sont des tournesols, poussent bien ici. These flowers, which are sunflowers, grow well here. Here qui refers to flowers. J'utilise de l'aloe vera tous les jours, ce qui est très bon pour ma peau. I use aloe vera every day, which is very good for my skin. Here ce qui refers to the whole fact that I use aloe vera every day, not just to aloe vera. Il se demande quoi choisir. He's wondering what to choose. Ce qui m'embête c'est son attitude. What bothers me is her/his attitude. Il a gagné la course, ce qui est impressionnant.He won the race, which is amazing. Ce qui in this suggests the word race is the subject. Why? I am really struggling with which is the subject or object in more complex sentences. Isn’t he the subject doing the winning ? In grammatical terms, it is the fact that he won the race which is amazing and not the race itself. So basically, "quoi" is accusative case, right? Any relation to complete/incomplete clauses? It seems to me that qui/ce qui are used when the following close is incomplete, and that que/ce que are used when the following close is complete. Is that true? Sub complete/incomplete with independent/dependent. It's been a while since I've taken middle school English! Also sub "close" for "clause." I really wish I could edit messages here! Hi Blake, I think you got it! If the relative pronoun (qui/que) refers to an object or idea which is not meantioned in the sentence, you need ce qui/ce qui. If the target of the relative pronoun is part of the same sentence, qui/que suffices. J'aime voir des films, qui me plaisent. -- I like to see movies, which I like (which-->movies). Is the below sentence correct in terms of usage of que/qui vs ce que/ce qui? Je m’assieds dans une chaise sur le balcon qu'est attaché à mon appartement. For some reason the "qu'est" doesn't look right to me but i dont know why. If any other errors, appreciate the correction on those as well. It should be ... qui est attaché... since the relative pronoun functions as the subject of the relative clause. Thanks for the reply. My confusion is that in my sentence, I thought "Je" was the subject and "le balcon" was either an object or something else. Any insight on that or link reference you have that could help me understand would be appreciated. Merci! Je is the subject of the main clause and qui is the subject of the subordinate close. Je m'assieds dans une chaise sur le balcon. Il est attaché à mon appartement. The second sentence gets attached to the first one by using a relative pronoun (qui), that stands in for the subject (it). Are the below two sentences correct uses of "que" & "ce qui"? Je m’assieds dans une chaise sur le balcon, ce qui je trouve relaxant. I see that i'm wrong. To follow the lesson above, it should be the following? Absolutely correct. I think you got it. Not sure about your question , can you add some context? It came from a lesson ....but i’ve Progressed and found the more advanced lesson which answered my question thank you Cécile! "Je ne sais pas qui lui plaît" and "Je ne sais pas ce qui lui plaît". Does the "ce" change the meaning from who(m) to what? Je ne sais pas qui lui plaît. -- I don't know whom he likes. Je ne sais pas ce qui lui plaît. -- I don't know what he likes. 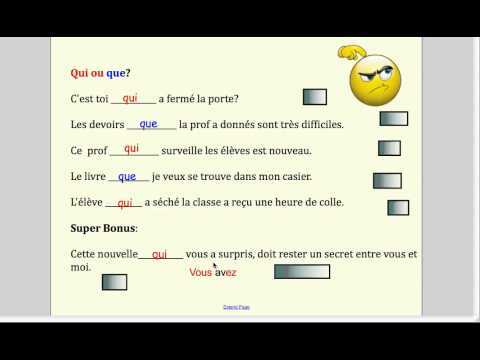 How do you know when to use Quoi in a situation where ce qui and ce que is present. Bonjour Diana ! 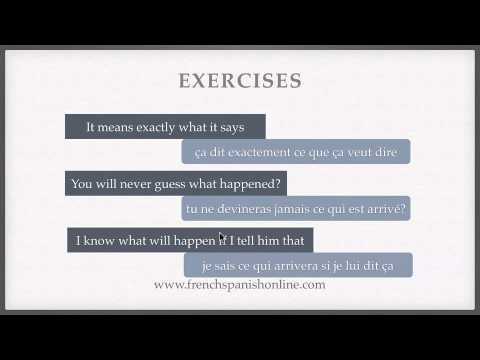 "Quoi" will be used when "what" is followed by an infinitive = "what to do, what to think...": "Je ne sais pas quoi faire." (I don't know what to do.) "Il se demande quoi choisir." (He's wondering what to choose.) I hope that's helpful! Then how is it possible that a French consumer's magazine is called Que Choisir? I always thought this meant 'what to choose', but if we follow the rule it should be 'quoi choisir'. Right? Along the lines of the "ce que" versus "que" question, must the question "Ce qui fait peur ici?" always begin with "ce que" because the answer is unknown (not mentioned previously?) even though it refers to a noun and not a phrase/sentence? If so, when can a question begin with Quel? Only if the answer was already mentioned? First of all, Ce qui fait peur ici ? is not correct, because as you need to have the element referred to by ce qui / ce que (what, which) mentioned in the same sentence. As for Quel?, it is used in questions where a specific choice is presented: it means "what" in the sense of "which (one)?" here. Hello, Can we also use "quoi"? like "de quoi fait peur ici?" Thanks in advance.